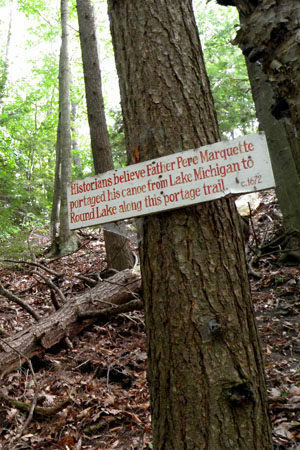 Portage Trail is the longest path in Petoskey at a mile from one end to the other. 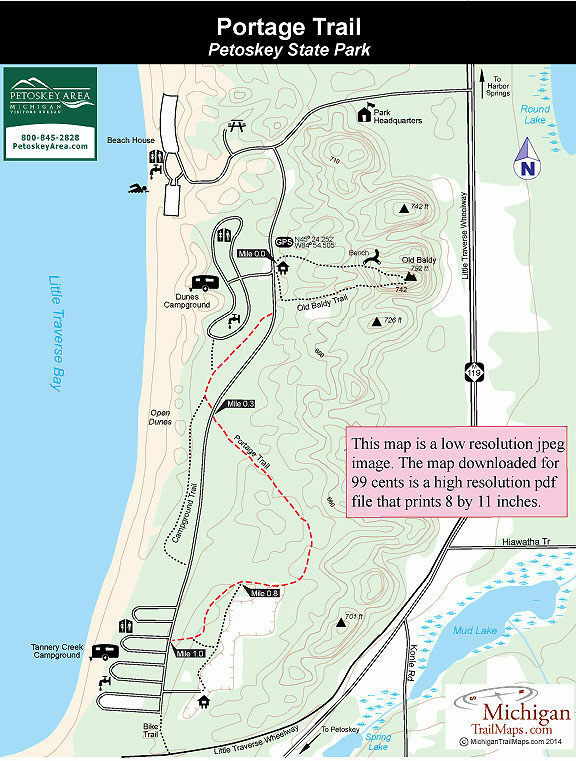 Older park maps show it as a partial loop but the actual marked trail extends from Dunes Campground to Tannery Creek Campground, crossing the park road to a forested area of some surprisingly steep hills. The trail picks up its name from the fact that historians believe in 1672 Father Jacques Marquette, the famous Jesuit priest and explorer, portaged his canoe through the park traveling from Lake Michigan to Round Lake. Father Marquette founded Sault Ste. Marie in 1668, St Ignace in 1671 and then went on with Louis Jolliet to become the first Europeans to see and map the northern portion of the Mississippi River. Portage Trail has trailheads along the park road near the Tannery Creek restroom and the firewood bin at Dunes Campground. You can also pick it up from a parking area across from Tannery Creek Campground at the south end of the park. This description begins at the Old Baldy Trailhead where there is parking for day visitors. If parking at the Old Baldy Trailhead follow the park road south for 200 feet and look for the posted trailhead just past the wood bin. The trail dips into the woods and within 150 yards merges with the Campground Trail from Dunes Campground. At Mile 0.26 Portage Trail veers east (left) away from Campground Trail and crosses the park road. On the other side you quickly arrive at a “Y” junction with the marked trail heading right into an interesting terrain of wooded dunes. At one point there are steep dunes on both sides of the trail before you descend into a meadow at Mile 0.7 that includes trekking across a patch of open sand. You pass an unmarked junction with a trail that heads south to skirt the meadow while the posted trail continues west into the woods to pop out at the park road across from the Tannery Creek Campground Trailhead at Mile 1.